BREM Holding Bhd, a relatively small property developer, is close to acquiring two plots of land totalling 16ha in the Klang Valley for some RM100 million, a company official said. "We are at an advanced stage of negotiations to buy land in Wangsa Maju (Kuala Lumpur) and Petaling Jaya (Jalan 225)," executive director Low Yew Hwa told Business Times in an interview last week. The group intends to build high-end bungalows in Wangsa Maju, while in PJ, it has plans for a commercial development comprising offices and showrooms. Work on these projects is, however, expected to start only one or two years down the line, Low said. Brem currently owns 200ha of land, most of which is in the Klang Valley and the rest in Sungai Petani, Kedah. Brem, which also does construction and has a small water concession business in Papua New Guinea, made a net profit of RM11.7 million in its last financial year ended March 31 2010, some 13 per cent less than the previous year as profit recognition from its past property launches came to a tail end. This year, however, Low is confident the group will do better, with profit from a new project it recently launched - the RM200 million Villa Orkid condominium in Segambut Dalam, Kuala Lumpur - expected to pour in. "We've had very good response for the 412 units. We anticipate this project will give us around RM50 million to RM60 million profit over two years," he said. Brem is also planning for the next phase of condominiums with a gross development value (GDV) of RM300 million, as well as semi-detached houses with a GDV of close to RM200 million. These will only be launched in the next financial year. Meanwhile, he said Brem and its partners had received a letter of intent from Malaysia Airports Holdings Bhd (MAHB) to build a hotel on 2.4ha of land next to the new low-cost carrier terminal in Sepang, Selangor. He said MAHB is currently drafting the agreement on the 25-year concession. Brem and builder Bina Puri Bhd will construct the hotel while Nikmat Maju Development Sdn Bhd, the holding company of the Crystal Crown hotel group, will manage it. Brem and Bina Puri will own 30 per cent and 40 per cent respectively of the project, while Nikmat Maju will hold the rest. RHB Research Institute Sdn Bhd is maintaining its overweight stance on the property sector with expectations for the price of property stocks to increase. The research house believes that there are still strong catalysts to drive demand for properties. They include faster growing of youngster to drive big-tickets purchase, low mortgage rate, aggressive promotions by developers and strengthening ringgit. It said the strengthening ringgit was likely to attract higher foreigners' participation in the Malaysia property market due to higher expected return from investment. "We note that over the past few months, some foreign-based funds have also acquired properties in Malaysia -- AEON Melaka Mall and 1 Mont' Kiara, showing increasing interests in Malaysian properties," it said. Apart from the fundamental drivers from demand, other supporting factors that sustain property prices include increasing land replacement costs. "As developers continue to replenish their landbank, land replacement costs will become higher, partially due also to the competitive biddings. "Hence, even though building materials prices have remained stable thus far, property prices in the primary market are likely to sustain at high levels even if developers maintain their margins," it added. RHB Research believes that the new regulatory measures will not hurt the property sector but could reduce some speculative activities due to lower leverage ability. "We think the overall impact on the property sector would be moderate as young populations are typically the first or second home owners and buyers who own more than two homes are generally the affluent group," it said. Based on its analysis on the relationship between young population growth and Average Residential Property Price, RHB Research believes that the property price will continue to increase over the next two years. On October 19, Kuala Lumpur will once again be the host for the International World Class Sustainable Cities (WCSC) Conference Series 2010. This year's event is a follow-up of the inaugural event held in March 2009 and will feature speakers from three cities. The highlight of the conference is an extensive case study on the township of Curitiba in Paraná state, Brazil. Co-organised by the Real Estate and Housing Developer's Association, Wilayah Persekutuan Branch (REHDA KL), the Malaysian Institute of Planners (MIP) and the Malaysian Institute of Architects (PAM), WCSC 2010 will explore and showcase strategies and practices that have helped global cities attain recognition for sustainable, world-class planning initiatives. The award-winning city of Curitaba will be the highlight of this year's conference, and their success story will be presented by the mayor of Curitiba Luciano Ducci and secretary of international relations (and representative of the Curitiba city council) Eduardo Guimaraes. Curitaba is home to a population of approximately 1.8 million people, spread over an area of 430 square kilometres — comparable to the city of Kuala Lumpur. In year 1968, Curitaba underwent major urban planning projects to manage its growth and has now become an international role model in transportation and the environment, as well as ensuring that economic and industrial developments are carried out responsibly in an organised manner. Today, Curitiba is a regional hub for trade and services and is one of the richest cities in Brazil and a pioneer in urban solutions, whose model has inspired urban planning for cities the world over. 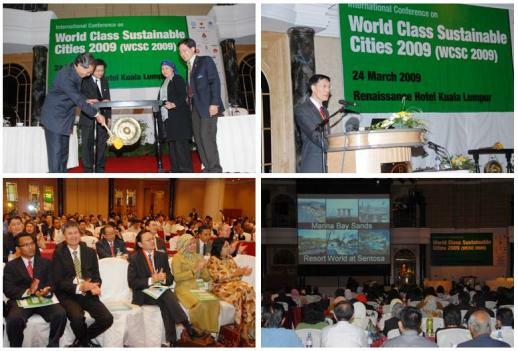 WCSC 2009 was also held in Kuala Lumpur and it saw a huge audience turnout. Following from the success of the conference in year 2009, it is expected that over 400 participants will be attending this year's event, comprising of members of the three organising bodies, other professional organisations, Dewan Bandaraya Kuala Lumpur (DBKL), other state and local Authorities, non-governmental organizations (NGOs), Residents' Associations and members of the public. The highlight of last year’s conference was a presentation on the regeneration of the Cheonggyecheon River in Seoul, Korea, and a 'wishlist' for a network of covered walkways linking hotspots for a pedestrian-friendly Kuala Lumpur. This may have inspired similar plans under the Performance Management and Delivery Unit (PEMANDU)'s "Greater KL" plan earlier this year. This suggests that the share of ideas at the WCSC Conference has opened everyone up on the possibilities in city planning. This year's event will be held on October 19 at the Royale Chulan Hotel, Kuala Lumpur. GEORGE TOWN: Two foreign property development companies – one based in Singapore and another in Hong Kong – and Eastern & Oriental Bhd (E&O) are among seven candidates shortlisted to bid for the new Penang Turf Club (PTC) development project. Most of the four remaining candidates are headquartered in Kuala Lumpur. StarBiz learnt that the Singapore-based group is one of Asia’s largest real estate groups which has public-listed companies in Hong Kong and total assets worth over US$40bil. Those shortlisted for the tender have the option of buying the 23.09ha site for RM200 per sq ft or developing the site jointly with PTC. It is learnt that those who submitted for the second round of bidding, which closed on Sept 30, had to pay a tender deposit of RM500,000. When contacted, E&O executive director Eric Chan Kok Leong confirmed the group had submitted a bid in relation to the PTC land. “Details are restricted by the confidentiality requirements of the competitive bidding process,” he said. According to sources, one of the proposals submitted by a Kuala Lumpur-based developer was for the development of more than 1,000 units of landed residential properties and condominiums over a eight- to nine-year period. The gross development value of the project was estimated at around RM1.5bil, based on the present market value of the PTC land of about RM500mil, the sources said. Because the PTC land is located close to the Jesselton residential area, the succesful bidder would be able to build six landed residential properties or 15 condominium units per acre, according to the present plot ratio guidelines set by the Penang Municipal Council. Over 20 property development companies, which included Penang-based developers, submitted their company profiles for the pre-qualifying round, which closed on June 16. After the 2008 general election, the state government rejected a proposal from Abad Naluri Sdn Bhd, an associate company of Equine Capital Bhd, to develop the RM25bil Penang Global City Centre on the PTC site, due to its failure to submit plans as required by the state. Worrying signs of a property bubble? In investing, nothing beats on-the-ground observations to get a better understanding of local culture. In that regard, having visited many major cities in Asia as an equities fund manager, I am now travelling more to second and third tier cities in the region; to meet and talk to residents about the local economy, industries and companies. I personally also find it more enjoyable and there is always interesting surprises. I was in Ordos, Inner Mongolia in the middle of September, to meet up with some friends who are local businessmen in construction, property development and coal mining. Ordos is special. It has gained international attention lately, often cited as a classic example of China’s property bubble or worst excesses – specifically, for building Kangbashi, a completely new administrative city about 25km from Dongsheng, the main city in Ordos County. It is largely empty of people, and that’s why it’s called the “ghost city” of China. Kangbashi was mostly completed in 2008 at an estimate cost of 17 billion yuan or US$2.5bil; it has ultra modern administrative buildings, museum, library and many middle to upper class homes (it is similar in a way to our Putrajaya – except bigger, a lot less people, with many very nice unoccupied houses). Many of the houses and apartments in Kangbashi are sold, it is now ready for 300,000 residents (the original plan is for one million residents when fully completed in the future) but there is only about 28,000 people living there (as at April 2010 according to China Daily). Ordos County is a rich mining area of about 1.6 million people. It is one of China’s major coal mining and natural gas producer (beneath Ordos is about 16% of China’s proven coal reserves and 33% of proven natural gas reserves). 2009 GDP per capita of Ordos (134,000 yuan or US$20,000) is higher than Shanghai (77,000 yuan or US$11,500) or Beijing (63,000 yuan or US$9,400) and quickly catching up to Hong Kong (US$29,900). There is clear evidence of wealth, for example, many of the cars on the streets in Dongsheng you see are new Mercedes, BMWs, Porsches and Range Rovers. Which leads us to back to the “ghost city”, the Ordos county government built Kangbashi because frankly, it is rich enough to afford it. The development succeeded in enticing wealthy local residents to buy into the new Kangbashi suburbs, which boosted the construction sector and kept some of the wealth in local property investments. Rich Ordos residents (and even local government officials) prefer to stay in the old Dongsheng city for now (I was told by some, until there is more facilities and people in Kangbashi. Seems logical. ); hence many of the completed luxurious houses in Kangbashi remain unoccupied. Property owners I spoke to say they are not overly worried about servicing bank loans as they can afford it or has fully paid up. They are just not interested to move in yet. I left Ordos with two property related thoughts. One, I believe Kangbashi is a special case and certainly is not reflective of property markets in China; it is more akin to lavish spending (in a very big way) that you occasionally see in natural resource boom towns. I was told the central government is in fact asking the Ordos local government to slow down new developments in Kangbashi as they begin to curb pockets of excesses in certain cities and segments (especially speculative investments) of the property bubble in China. Second, I do agree that property prices in certain Chinese cities and segments may seem high. In Beijing for example, local born Beijing residents mostly now buy properties outside the fourth ring road (about 8km from the centre) up to fifth (10km away) and sixth ring road (15km to 20km away). Properties inside the fourth ring road are just not affordable. These are bought up by the rich from neighbouring provinces such by coal mining tycoons from Shaanxi, Shanxi and Inner Mongolia (no doubt from Ordos too). According to a BCA report, the price-to-income ratio for 2010 in cities such as Shenzhen is about 25 years (in other words, the price of properties is equal to 25 years of household disposable income), for Beijing it is about 18 years and Shanghai is about 13 years. However, average house price can be distorted, for example, by the much higher prices paid by rich tycoons of Shanxi for condominiums inside the fourth ring road of Beijing. Similarly, household income may also be under reported. BCA research shows that since 1998, China’s urban household disposable income per capita has risen in line with the average rise in property prices. Therefore on average, people can still afford average houses. My view is China will continue to be firm in curbing excessive speculation and price increases (the latest curb on 29 September include minimum 30% down payment for housing loans; and no bank lending for third and subsequent home purchase). I believe some of the more speculative locations are likely to consolidate, perhaps dropping as much as 20% to 30%. Such price declines however, is not likely to cause a China banking crisis, nor will it likely affect economic growth. In fact, any slowdown in economic activities is likely to be offset by the government’s push to build more affordable public and private housing; with incentives such as tax exemptions for builders and owners of a segment of low income housing sector. Interestingly, rising home price is a relatively new phenomenon in China. Compared to the many decades of booming house price in Japan (estimate from mid 1950’s until 1991), the “duration” of the current China property bubble is relatively short – private residential market in China only started to develop in 1998, and began to prosper around 2003. With sharply rising property prices since mid 2009, China is acting early to try to bring stability to the housing market. Having learned from past experiences (of Japan and US) about the dire consequences of a prolonged property bubble and excessive bank credit; China has been strengthening the balance sheet of banks, calling for more capital and restricting housing loans to curb speculations. Having said all that, I also believe that any downward adjustment in prices may be temporary, China’s property prices is likely to climb for quite a few more years as the economy develops and urbanisation increases. I leave you with this fact from Global Property Guide: Property prices (in US$ per square meter or psm) in Shanghai (US$6,000 psm) have yet to catch up with international metropolitans such as London (almost US$20,000 psm), New York (about US$16,000 psm), Moscow (about US$16,000 psm), Tokyo (about US$14,000 psm), Singapore (about US$13,000 psm) or even Mumbai (about US$12,000 psm). The writer is the founder and chief investment officer of Singular Asset Management Sdn Bhd.